Stock picking dominated Wall Street when there were no other products available to traders and investors except individual stocks. Picking stocks using fundamental analysis is a complex process that requires substantial knowledge and effort but using chart analysis to select stocks is a remnant of the past and usually plagued by confirmation bias. After following a link in Twitter the other day I was directed to a website where subscribers pay to have access to stock picks. I was amazed to see videos of individuals drawing lines on charts and identifying chart patterns for the purpose of recommending stocks. Usually these individuals were sitting in front of many screens and they spoke with the attitude of an expert. In reality, most are fools (there are some exceptions.) Below is an example for WMT I made up just to illustrate the most common process followed. The first step of most of these individuals (there are some exceptions) is to draw some line on the chart that supposedly indicates the longer-term trend, in this case in WMT the line was violated recently and the stock appears to be on a downtrend. Then they may refer to a moving average, usually the 200-day, and say that this was also violated recently, as it is the case above. Next, they use some fundamental analysis to confirm the bias of a downtrend. They will talk about earnings, P/E ratio, news, etc. 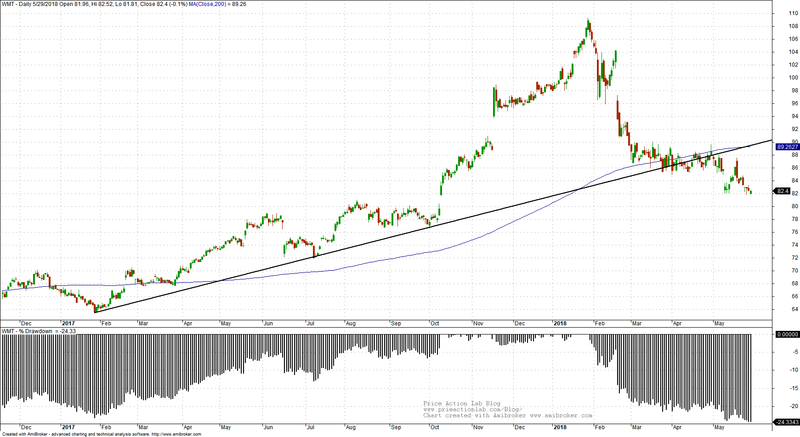 The conclusion follows, which is usually the preconceived trend, in this case downtrend. What is wrong with this analysis? To start with, this is a random analysis process and there is no way of knowing its longer-term expectation. Even if an analyst has been lucky for several months or years, reversion to the mean may follow. Then, the stocks have usually formed a top or bottom already. Rarely an analyst will recommend to short a stock on a strong uptrend or buy a stock on a downtrend. It’a all confirmation bias driven. There is also data-mining bias when the analyst scans many stocks and picks the ones that appear to fulfill some criteria. To correct for this bias, validation must be done, which is usually never the case since it is impossible to do it in lieu of a rigorous model. But how do these services survive and have so many subscribers? Since stock picking with chart analysis is random, the longer-term expectation of all analysts in the service is zero before transaction costs. But some of them will show exceptionally good performance for a period of time by luck alone. These services need a large number of contributors to maximize the number of lucky analysts. Then, they can always point to the ones that have performed well during a certain period. The key is to have a service with hundreds or even thousands of analysts picking stocks. Usually those random analysts are not paid but are promised publicity. There will be always exceptional winners by luck alone that will attract more subscribers and then lost when they turn to losers but at the same time some others will turn to winners and attract more subscribers and so on. 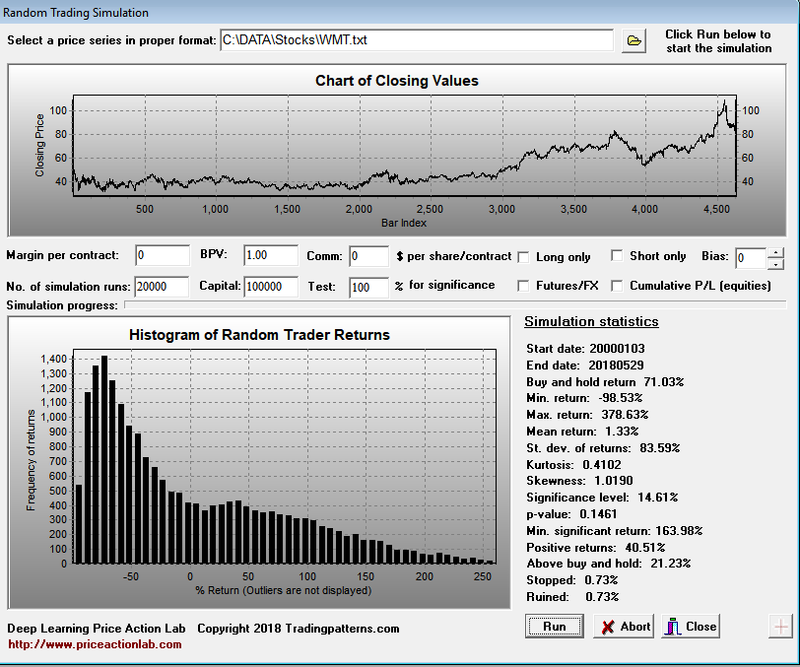 In order to illustrate this I have made a random trading simulation of the WMT stock above with data since 01/2000. A fair coin is tossed: if heads the stock is bought, if tails, it is shorted. Open positions are closed and reversed accordingly. No commission is included to just illustrate the effects of random predictions. The simulation is repeated for 20,000 random traders/analysts. The results are shown below. Although buy and hold (adjusted) total return is 71.03%, some random traders made way in excess of that and up to 378.63%. In fact, 21.23% of random traders made more than the buy and hold performance! A return of 163.98% in the tested period is required for a p-value equal to 0.05, which is more than twice the buy and hold total return. Proving skill is not that easy. Only a fool would draw a few lines on a chart, refer to some random fundamentals and make a call of stock direction. Experts at hedge funds spend weeks or months analyzing fundamentals using advanced finance techniques and still have to come up with a long/short portfolio to minimize risks. Yet, the fools reach conclusions in a matter of a few hours. There is someone in Twitter who once said that he goes through 2000 charts every weekend to make his calls. This is an example of someone that has no real connection to stock picking analysis, which is a hard and demanding process carried out by specialized analysts in major funds and investment firms. There are also those remnants of the 80s in social media that post stock charts with a few lines on them possibly unaware that the volume in stock exchanges is ruled by HFT and algos to the tune of 75% – 85%, as a recent government report showed. Trading is dominated by algos and investing is dominated by growth and momentum. Hedge funds are mostly long/short, either with fundamentals or recently with machine learning. Anything outside of that domain represents a lost connection with the modern markets. Technical and quantitative analysis of Dow-30 stocks and 30 popular ETFs is included in our Weekly Premium Report. Market signals for longer-term traders are offered by our premium Market Signals service.